Allison, store manager & designer, Chari, sales & designer & Sydney, sales.Just after you walk through the front door of San Clemente’s Urban Renewal Décor home furnishings and decorating store on Avenida Pico, you are compelled to stop suddenly in your tracks. Why? Because your vision is besieged by hundreds and hundreds of distinctive decorating items, accessories and furniture. Your sense of smell tingles from the fragrances of aromatherapy candles, and your fingertips caress the fine textures of the nearby newly arrived clothing. At the threshold, for fear of walking past something that you would regret missing, you look around in a slow, appraising 180-degree arc, seeing at first the items only a few feet away, arranged artistically on low tables. From there your eye traces to scores of high, well-ornamented plateaus. Your ears welcome a cheerful greeting from within the store, and to top it off, the offer of a fresh cookie or candy to enjoy during your browsing. Gingerly beginning your trek into the store, your mind assesses the names and potential uses in your home for the countless items surrounding you. It is a treasure land worthy of much roaming and one thing you know for sure…you will be there for a long time and you will surely find more than one wonderful item for your home. Store manager Allison Huband says the eclectic style of home furnishings and accessories carried at Urban Renewal is heavily influenced by “an old-world tradition, with a Tuscan influence.” Items found there can help you create a comfortable look, or a classic contemporary surrounding that touches your soul. Richard and Debbra Brown with their children (L-R) Cheyenne and Jorden.Urban Renewal Décor carries furniture and accessories for every room in home and office, including many wood types, leathers, upholstered furnishings and custom-made furniture. New items arrive almost daily, imported from around the world or obtained from local artisans. And that is not the end of it; there are also clothing, handbags and jewelry from seven different national and international lines, “all with the popular, slightly bohemian look” says Allison. Allison and Chari with their vast home decorating experience will also come visit your home and make decorating suggestions, or you can contract them at an extremely reasonable rate to redecorate your home completely, using their magic touch. 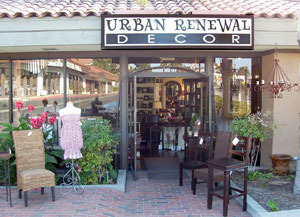 Urban Renewal Décor is nine-years-old, and is owned by Richard and Debbra Brown, who began in the home furnishings business 12-years-ago with Laguna Iguana Rustic Furnishings in Laguna Beach. The Laguna Iguana warehouse-type store in Laguna Niguel on Camino Capistrano is a Mecca for customers from around the country. It is chock full of wondrous things, all with a feeling from “Old Mexico” to “Old Tuscany”. Just over four-years-ago, the Brown’s moved back to southern California after living in New Zealand for a year and a half. They enjoyed a pastoral existence in a pristine environment that was nestled amidst rolling green hills, and surrounded by flocks of sheep and roaming chickens. Dana Point being their original point of departure, they relocated a bit further south, to the laid back coastal community of Leucadia. 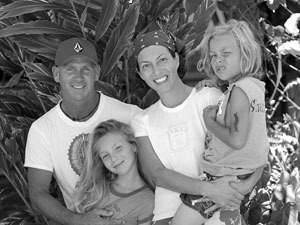 Richard, an avid surfer, still enjoys the ‘lefts’ up and down the west coast and has recently traveled to the Maldives and Tavarua for surf trips. Looking even younger than her 27 years, manager Allison Huband has had many years of redecorating and furnishing experience. With the Brown’s for almost seven years starting out in the Laguna Iguana store, Allison has always had the desire to, “make rooms look the best they could look”. Additionally, she has studied art, design and communications in college, all contributing to her success at becoming manager of a quite significant San Clemente business at a surprisingly young age. “I’d been a customer of both Urban Renewal and our sister store, Laguna Iguana, and so when I saw the ‘employee wanted’ ad, I couldn’t get over there fast enough,” Huband stated. Chari and Allison, along with part-time sales associate Mrs. Sydney Schweitzer, says that the three of them believe in always creating a fresh look for the store. There is never over buying of a particular item so the store always has new and unique items for everyone. Urban Renewal on Avenida Pico. “We are always looking for new lines so offerings in the store stay highly contemporary,” says Chari. All three women live locally (San Clemente & San Juan Capistrano) so they understand the decorating needs of the community. The three operate in the store like a close family, says Chari. You can reach the staff at Urban Renewal Décor at 366-6099 and by e-mail at: tyle@urbanrenewaldecor.com.